When I interviewed Canada’s Top Growth Investors (Jason Donville, Martin Braun, Peter Hodson, Martin Ferguson, and Ryaz Shariff) for my National Bestselling book, Market Masters, I learned from them how they went about discovering high-growth stocks. The common characteristics were: small/mid-cap, low prices, low/ or no dividend, mostly knowledge-based industries (e.g. technology, healthcare, consulting, etc. ), new products/services, intelligent capital allocators as managers, and high rates of growth in book value per share, earnings per share, and free cash flow per share, as well as high returns on capital, all combined with durable competitive advantages. As an example, Jason Donville’s investment in Constellation Software is a 30-bagger (i.e., a $1,000 investment turned into $30,000). There’s more examples in my book. I’ve posted for you below the 30 best-performing U.S. super stocks of the past 30 years. There might be some surprises in the list. 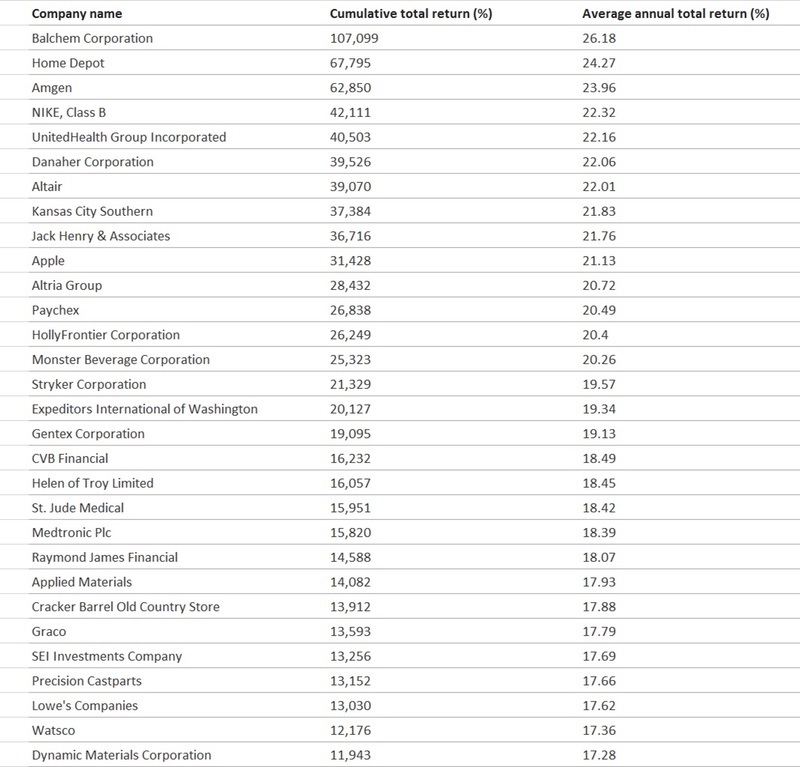 For example, The Home Depot (#2 position) has achieved a total cumulative return of 67,795%. And you might own some of these stocks in your portfolio today. But remember that while these super stocks are now all mature large-cap companies, at one point in time they were small/mid cap stocks. The question is, which stocks today will turn out to be the top performing stocks in the next 30 years? Email me your predictions.